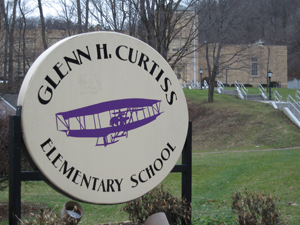 HAMMONDSPORT—Hammondsport Board of Education voted three to two Wednesday night to accept a proposal from the town of Urbana to enter into negotiation for purchase of the Glenn H. Curtiss Memorial School. Urbana’s was one of three proposals on the table. Board members Nancy Torp and Rick Drain joined president Jim Zimar in voting for the Urbana proposal. Members Francis Curran and Christine Kolo dissented. The school district’s broker will now enter into negotiation with town representatives for a purchase agrement, on which the Board of Education hopes to act in its December meeting. Superintendent Kyle Bower said Thursday that no terminal date had been set, leaving open the option of negotiations extending past that date. If for some reason no final agreement could be reached, he said, the process would need to be begun anew. Noting that this is a real estate transaction, Bower declined to name the two unsuccessful bidders, or to describe any details on any of the bids. Curtiss School closed for classes in June after nearly 75 years of service. Originally a K-12 school, the building of late had been used as a middle school. Built as a New Deal project during the Great Depression, the school stands partly on property donated by the family of Glenn Curtiss, the home-town hero who dominated early American aviation. Curtiss’s home and original manufacturing plant once stood on the site. Curtiss died in 1930. All Hammondsport P-12 classes are now conducted at the newer Main Street site.